Are you and your team faced with the dreaded assignment of having to write your company’s HR Policies & Procedures Manual? Or even worse, you’ve been given the task of updating an unwieldy doorstop of a manual that’s been neglected for years? Are you guilty of procrastinating on getting started because you perceive this as a mega-project? Or you have a sketchy idea of what to write but it’s all disjointed and incoherent, making it almost impossible to decide where to begin? If so, this 1-Day workshop based on my bestselling book, “Your Obsolescence-Proof HR Manual” is for you. 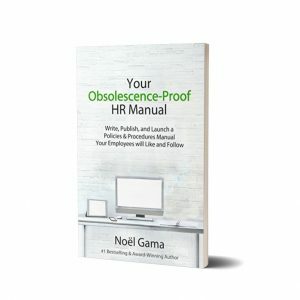 As the ever-loaded HR executives that we are, we don’t really have enough time to set aside from our busy day-to-day schedule for writing a book-sized manual. In this workshop I will show you my own process of writing, publishing and launching a slim, easy-to-manage and quick-to-maintain manual that is obsolescence-proof, user-friendly and online-ready. Turn this so-called dreaded assignment into an opportunity to become a celebrity employee by authoring a high-quality, always current HR Policies & Procedures manual! And most importantly, you will have the knowhow for writing a manual your employees will like and follow.